Tension Frames are a modern take on poster hanging displays. 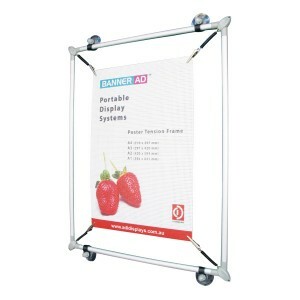 The lightweight aluminium frame acts as the perfect border around the graphic which is centred with the use of aligator clips and connecting springs. This adds style and class to the print in any given situation. Available in the standard sizes (A1, A2, A3 & A4) all of which are able to be displayed in both portrait and landscape orientations.